From looking like one of the favourites to go down this season, the points difference between Dorchester Town and the Evo-Stik Southern Premier Division bottom three is now into double figures. An incident-packed 5-3 win at Creasey Park in Dunstable – a fifth win in seven for the visitors – lifted Mark Jermyn’s men to 17th place in the table and took them another step closer to safety. Coming back to triumph from 3-1 down on Saturday again shows how far Dorchester have come over the last month under Jermyn. The fact that the hosts went down to 10 men while leading 3-2 can’t be overlooked, however, everyone knows how much har-der sides who have a man sent off can make it for their opponents. After arriving at the ground late due to traffic congestion, the Magpies were caught cold just a few minutes in when Elliot Bailey put the home side in front. An Adam Watkins shot took a wicked bounce and Alan Walker-Harris could only parry the ball out to Bailey who despatched it with ease. Conceding so soon into a game would have completely knocked the stuffing out of the visitors earlier in the season. But the Magpies are an altogether different animal these days and it didn’t take too long for them to respond. Dan Smith’s cross just evaded Bradley Tarbuck but fell to Nathan Walker and when his effort was saved Ben Watson was on hand to make it 1-1. 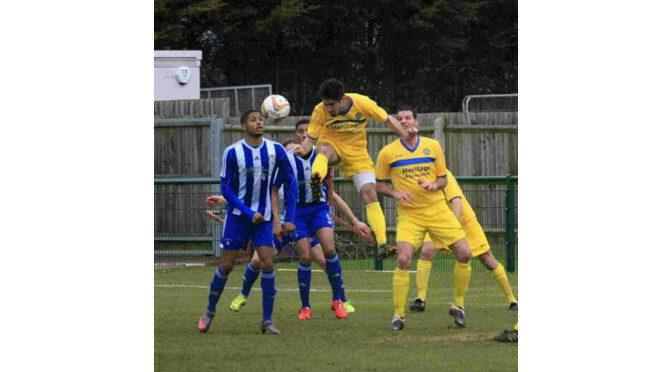 Dorchester’s character was then tested again when, in the space of two minutes, Dunstable scored twice. The first of Jemale McKenzie-Lowe’s goals was set up by Christopher Marsh and came after Charlie May had kept out a shot from Watson at the other end of the pitch. There was barely time to draw breath for the Magpies when Watkins stole possession, fed McKenzie-Lowe and the striker finished past Walker-Harris. With his side staring down the barrel at the point, player-manager Jermyn made a crucial tactical change. He moved himself into midfield and dropped Walker back to the centre of defence – and the change worked. Bedfordshire referee Andrew Aylott gave Dorchester a lifeline when he awarded them a penalty following a foul by Luke Ruddick on Jake Smeeton. Debutant May saved Watson’s spot-kick and the follow-up but skipper Smeeton forced the ball home via a deflection off the luckless Ruddick. Worse was to follow for the defender as just seven minutes after the goal he was rightly dismissed for a second bookable offence – he had also been cautioned for the challenge that led to the penalty. Even though they led at half-time, Dunstable didn’t exude the air of a side in perfect harmony. And it took just seven minutes of the second half for Dorchester to draw level. Some excellent build-up play resulted in Sam Lanahan, in the side with Lewis Morgan nursing a groin strain, netting for the second time in as many games. The hosts made a double substitution in the hope of shoring things up, but no such luck. Chris Dillon, also on target at Frome a few days earlier, got his name on the scoresheet again following a goalmouth scramble. And the three points were made safe soon after when Tarbuck produced a superb finish to score his first goal for the Magpies.